On our farm there is a balance between pasture and forest. Large portions of our land remain as woods, with a variety of native flora and fauna. In addition to the diverse array of wildlife, we especially enjoy the abundance of wild plants growing uncultivated on the hillsides and amongst the trees. Throughout the warmer months, there are several edible plants and berries which we harvest and eat, sometimes raw but often not. One of our favorites is the Oregon Grape. Although it looks surprisingly similar to a blueberry, the two taste nothing alike. Oregon Grape is gorgeously bitter, with a citrusy flavor and a hint of sweet. Herbalists say it has impressive health properties, but all we know is it is beautiful and fun to eat, although in limited amounts because of its tartness. Like eating lemons, only different. 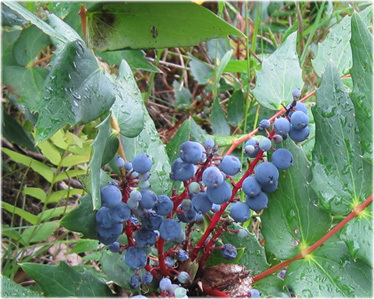 One of the reasons Oregon Grape has a reputation for aiding in digestion might be because of its bitter qualities. As it touches your tongue, herbalists say it stimulates digestive secretions, leading to enhanced digestion. We haven't tested this claim, but we can verify that the berries definitely make you pucker. The best time to pick them up here on the mountain seems to be in late summer. They grow alongside prickly evergreen leaves, in small clusters like actual tiny grapes. The plant grows close to the ground, and is easy to miss if you're not watching for it. Another one of our favorite wild berries is the Thimbleberry. It's a beautiful, rich red berry with a delicate tangy-sweet taste. Being ever so fragile, it doesn't lend itself to large-scale commercial cultivation. 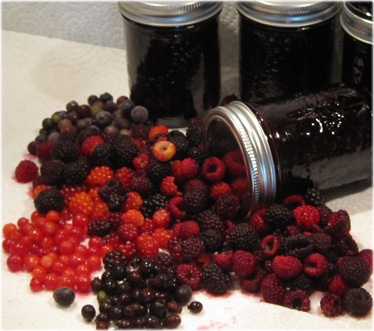 In fact the berries can't be stored for more than a day, unless you freeze them. Plus, all the berries on the bush don't ripen at the same time --- so harvesting a single bush can require several return trips. Although thimbleberries grow prolifically in the wild throughout the lower mainland, they're still something of a novelty. Unlike the amazing blackberries which grow in profuse abundance throughout the region and produce copiously, the thimbleberry is more retiring. You need to pick a lot of thimbleberries to really do anything with them. And frankly it's very tempting to just gorge on them as you pick. 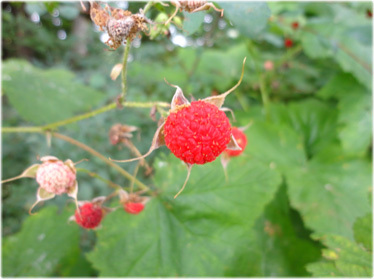 There is no other berry like the thimbleberry --- it has a dry texture which makes you want to keep eating it. And because you can rarely find thimbleberries in large quantities, it makes the discovery of a fruiting bush all the more delightful. Our all-time favorite way to eat these fabulous wild fruits is as a delicious fruit-spread, enjoyed on healthy bread or in whole yogurt. The wild flavors explode on our tongues, and as a special invigorating treat, it can't be matched. We have a limited supply of Wild Mountain Berry fruit spread in stock, which you can purchase here.